Wow, internet, we sure do love a good debate, don’t we? Things I had no idea were ‘Things’—with a capital T—are the stuff of heated discussion for parents online. How dare you pierce your child’s ears!? How dare you let your kids wear that!? How dare you allow them to dye their hair!? As a kid, my mom encouraged me to do “crazy” things to my hair—it was the 80s, and she thought an undercut with a spider web shaved into it would be super cool. I, however, did not. I erred on the conservative side fashion-wise for a good many years, so fighting over outlandish hair styles wasn’t something we had to do. When my daughter asked for brightly coloured hair in grade three, I admit I hesitated. What would other people think? What message was this sending? And more importantly, why was I conditioned to even ask myself such questions? It’s just hair, I told myself. Shave it, cut it, style it, dye it—it’ll grow back if mistakes are made. This was a chance to give my daughter some ownership over herself, and her style. She was choosing to express herself, and I figured it was a pretty easy thing to allow her to do. 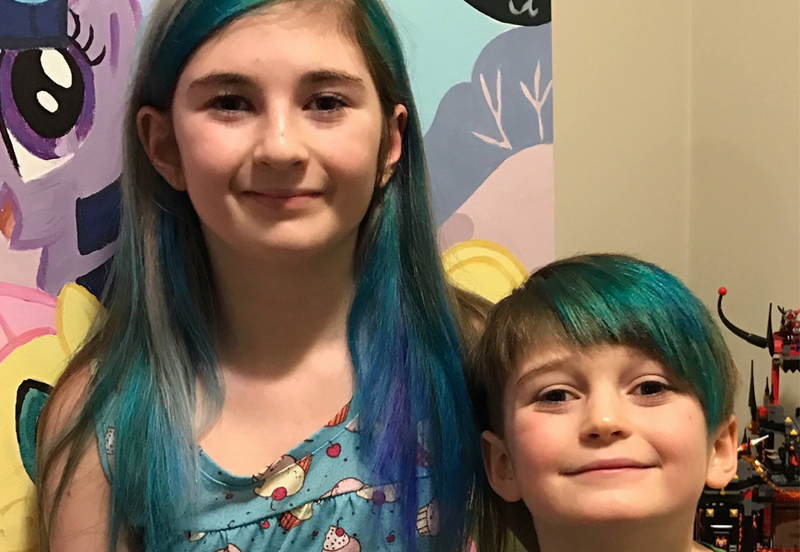 Both my son and daughter have had brightly dyed hair at various times, at their own request. When my daughter had hot pink extensions glued into her hair, my son (then four) had one, too. When big sister had pink, purple, and blue dye, little bro opted for colours, too. Some parents made comments about it, many saying just loud enough for me to hear that they’d never allow their children to dye their hair, but you know what? That’s ok. That’s the beauty of parenting: we get to choose for ourselves what we allow our kids to do. I researched the pros and cons and gave the kids a thumbs-up, and we regularly use a vegan formula we consider safe on their hair. The thing with bright dyes is that they’re semi-permanent, so they wash out after a while and they do little damage to the hair. Only recently did we allow the kids to have some strands bleached in order to help the dyes stay in longer. The awesome thing about hair is that it grows out fresh and healthy, and damaged ends can be trimmed off. I have little case to make against dying given that my own hair is dyed. To me, hair is fashion. Like anything else my kids love wearing, it’s just another way for them to exert independence in a safe way—I say we should embrace it, and talk about why people enjoy modifying their looks. It opens up new conversations for us to explore why humans have done these sorts of things for so long. Both my kids are adventurous with the clothes they wear, and we love to embrace their style and see no need for it to exclude their hair. As with anything we let our kids do, to me, it’s just not a black and white issue, but it’s a great way for us to give our kids choice, when so often their lives are controlled by the adults around them. I know that being a little “edgy” makes them feel proud, and there’s little I love more than seeing them confident in choices we’ve allowed them to make. Come on, Mom and Dad… let the kids experiment a little. Maybe you’d look good with a pink streak, too? Funny. My son just said he wanted to dye his hair blue. 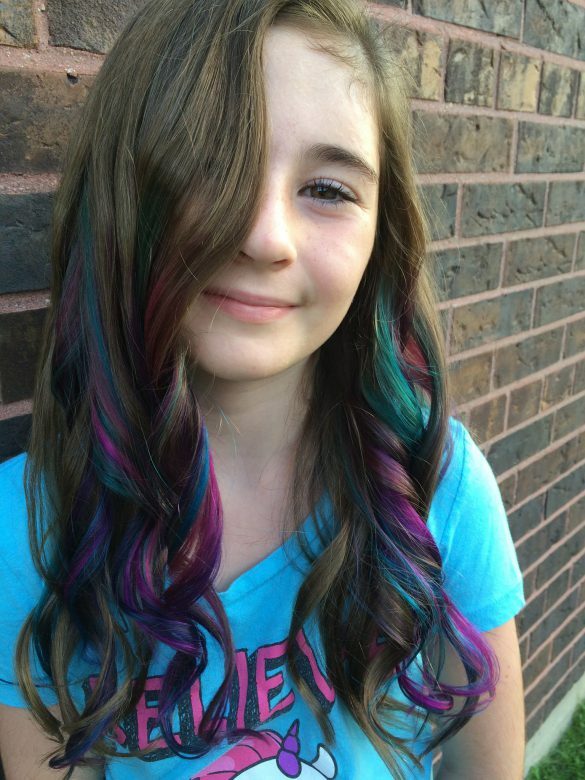 I said sure…and asked a friend (who dyed her son different colors). She asked him..what parts? He was like “oh, I dunno.” Hahaha he didn’t get that far. I don’t have any issues with it (obviously) but I know his grandmothers will. Hahaha oh well.